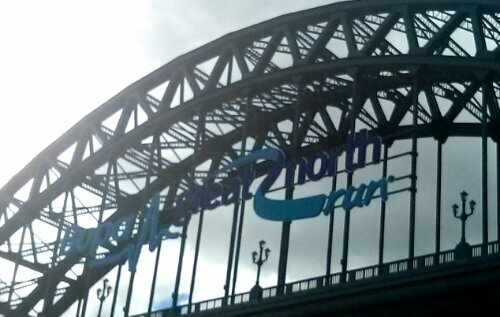 The weather forecasts for the morning of the BUPA Great North Run were grim: cold, heavy rain, winds of 18mph gusting up to 30mph. I peaked my head out if the door we was pleasantly surprised but the conditions – maybe this half marathon wouldn’t be a battle against nature’s forces after all. I arrived close to the race start time so I started at the back of the field. A cautionary note to anyone planning entering in future years- if you arrive late your starting pen may be full and you may have to start much further back. Being the largest half marathon event in Europe, the starting pens stretch forat least half a mile and I counted two water stations before the start line! The atmosphere was fantastic – huge crowds cheered on over fifty thousand runners, love bands played throughout the course, there were plenty of fancy dress outfits, the Red Arrows flew overhead and Elvis sang from a bus stop. What more could one ask for? The course was relatively flat, well marked and there were plenty of water stations whilst taking in some beautiful scenery around Newcastle and Gateshead. I had initially decided to enjoy the run and not push too hard, given the unfavourable forecast plus I was starting at the back of the course. However, as I weaved through thousands of fun runners, I noticed my GPS watch reporting that I was running faster than I had anticipated, so I just kept that pace, enjoying the distraction of side shuffling through runners and spending most of the race on the pavement or grass verges. Before I knew it, I was running my way to a new PB! The walk back to the metro was long, but I was still floating on an endorphin cloud from my unexpected PB. The Red Arrows continued their aerial acrobatics and the heavy rain even held off till I got indoors. Result!